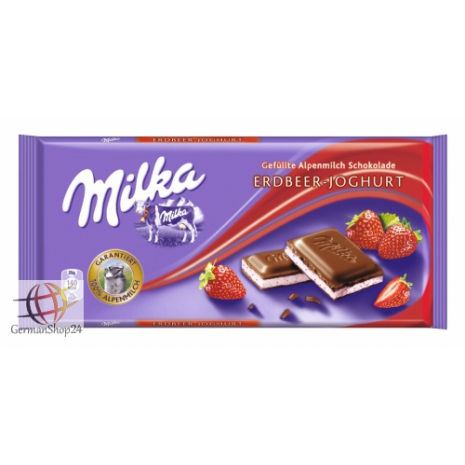 Alpine milk chocolate with a skimmed milk yogurt cream filling with strawberry flavor. 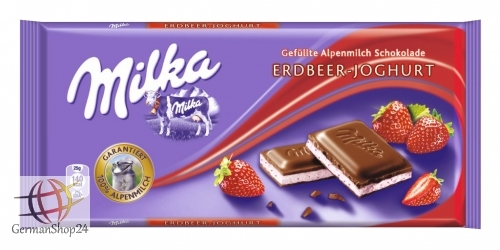 Finest Milka Alpine milk chocolate filled with a cream of strawberry and yogurt. Refreshing, fruity and chocolatey. The ideal snack for the summer. Sugar, palm oil, SWEET WHEY POWDER (from MILK), cocoa butter, SKIM MILK POWDER, cocoa mass, BUTTERFAT, emulsifiers (SOY LECITHIN, sunflower lecithin), dextrose, flavors, HAZELNUTS, dried strawberries (0.2%), maltodextrin, citric acid. Zucker, Palmöl, SÜSSMOLKENPULVER (aus MILCH), Kakaobutter, MAGERMILCHPULVER, Kakaomasse, BUTTERREINFETT, Emulgatoren (SOJALECITHIN, Sonnenblumenlecithin), Traubenzucker, Aromen, HASELNÜSSE, getrocknete Erdbeeren (0.2%), Maltodextrin, Säuerungsmittel (Citronensäure).